I’m as eclectic and contrarian about Buddhism as I am about Western religions. I’d like to say that I come from a long line of eclectic contrarians, but thanks to the Holocaust I’ll never know much about my ancestors’ personalities. My meditation practice is primarily what you might call Zen light, or mindfulness, or insight/vipassana, but Shin Buddhism attracts me as well. So every once in a while I say mantras, like Namo Amida Butsu, or honor the Amida Buddha. The Amida Buddha is not Siddhartha Gautama or any other individual Buddha (awakened one), but rather the essence of Buddha-hood. The Buddha Nature that’s within all of us. Shin Buddhists, as well as many other Buddhists and Hindus who use mantras, often wear malas around their necks or wrists. They use them like rosary beads, holding one bead for every time they say the mantra, adding a tactile aspect to the meditation as well as an easy way to count. Shin Buddhists also find the malas a comforting reminder of the closeness of the Amida Buddha. But that’s not the only reason I wear malas. The beads I wear around my neck in the first photo are the same set that my son Thomas wore around his wrist in the second photo. The second photo was taken was taken at a family wedding reception about a year before Thomas died. 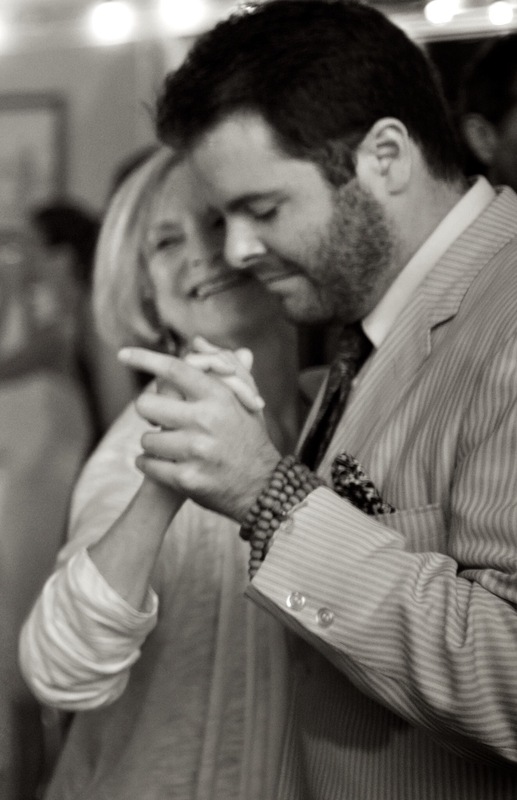 In the first days of our grief this June, Lauren Chela Harkrader Rosas — the bride that night and now on her way to join us in mourning — found the image of Thomas dancing with his mother and my wife, Carol, off to the edge of the photo of the her parents. The depth of field was good enough to crop it into an image that will always mean much to our family. What stands out to me in that image is the smile on Carol’s face, her joy at being held in her son’s arms, and a number of clues to Thomas’s persona. He’s impeccably dressed and groomed. Tie strait. Beard neat. With a touch of flair in the pocket square and a hint of nonconformity in the malas. 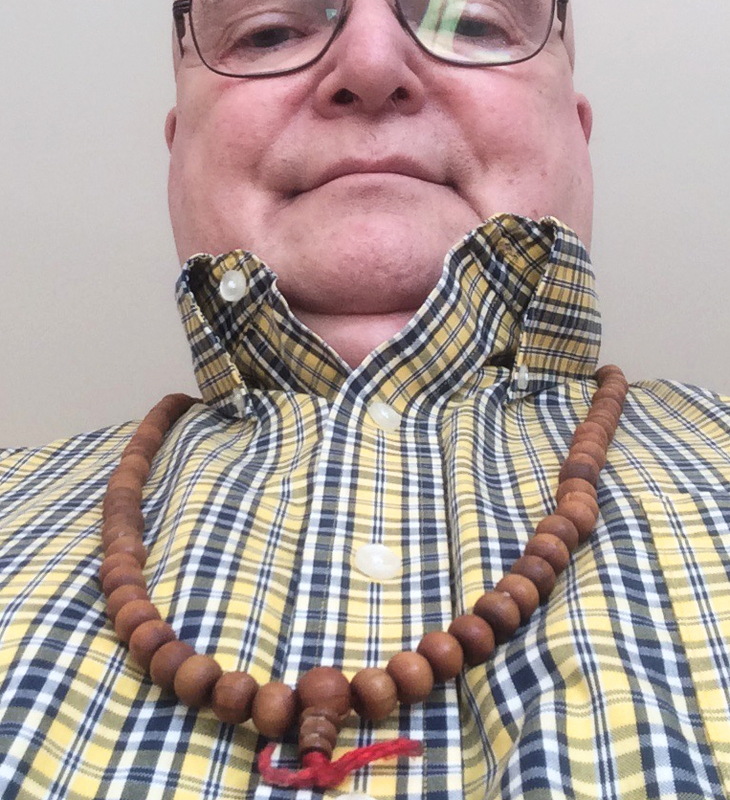 Thomas and his roommate and good friend, Joe Daniel, a follower of Tibetan Buddhism, enjoyed shopping together for malas, and I have been wearing that set almost every day, along with a mala bracelet of my own, since Joe and I divided Thomas’s meditation beads about a week after he died. It will come as no surprise to most parents of young men, but Thomas never overflowed with details of his emotional and spiritual life. Wearing his beads now gives me a way to connect. But the malas have brought with them a surprise benefit. They are a conversation-starter with folks who know what they are and might not otherwise talk with a stranger about religion and meditation. The usually grim and taciturn Sikh post office clerk smiles broadly now when it’s my turn in line, and we discuss meditation techniques. He has even recommended a teacher for me. One day as I checked out of a 7-11, the young clerk asked me dubiously what I do with the beads I was wearing. When I replied that sometimes I meditate with mantras, he relaxed and told me about his Hindu faith. It seemed to relieve him that he could share his deep faith with a person of European descent. I live in an area with many fundamentalist Christians, so exchanges like these don’t take place every day. For me, the malas have been a meditation aid, a reminder of the Amida Buddha’s closeness, a connection with my son, and an opener of avenues for sharing with immigrants from the East. Namo Amida Butsu and Namu Amida Butsu are two ways of saying the mantra I mention. A third is Namo Amituofo. For reasons too complex for this note, the mantra is often said 108 times, so there are 108 beads in most mala sets. I found this post educational (I’d known of mala beads, but I hadn’t known exactly how they were used, or that they could be worn around the neck). I can understand how they might give you a way to connect with your son (sorry for your loss, if I haven’t already said that). Thank you. It was his death that called me to make this blog my life’s work.. Since the post was educational, I’ll add that the 108 is because there are 108 Hindrances, and you say the mantra once for each Hindrance. But the complication is, I don’t read Pali or Sanskrit, and in the English translations many of the Hindrances sound the same to me. So maybe in English there are only 92 Hindrances; I don’t know. I assume what they hinder us from is walking the Eightfold Path.